In November 1865, the Norfolk County Court petitioned the officer of the Freedmen's Bureau in Norfolk to take away the firearms belonging to African Americans. Local white residents had complained complained about African Americans "in the habit of bearing arms," whom they described as "prowling about during the hours of the night, plundering property and engaging in other unlawful acts prejudicial to the good order and interests of Society." 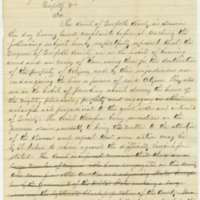 Norfolk County Court, “Petition of the Norfolk County Court to Col. Thomas F. Jackson, Norfolk,” Remaking Virginia: Transformation Through Emancipation, accessed April 18, 2019, http://www.virginiamemory.com/online-exhibitions/items/show/584.